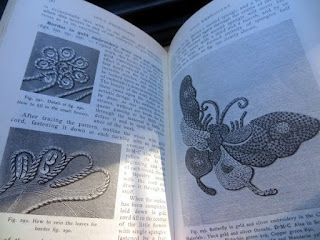 My collection of needlework books is very precious to me, and I found I couldn't part with any of it during the recent purge here at Hugs Central, Condo Edition. 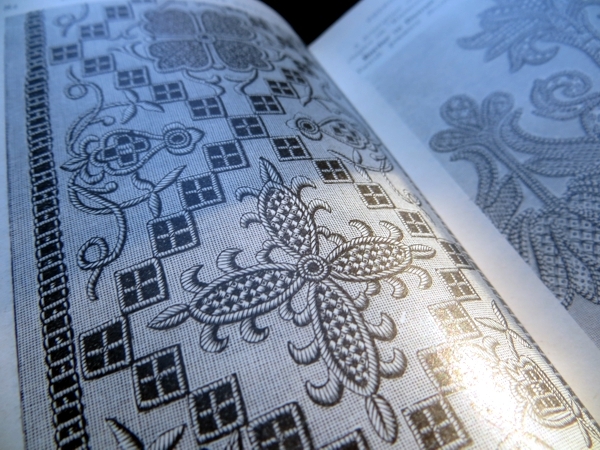 The large sheets of detailed drawings are amazing for learning purposes but they inspire, as well, and best of all: they remind me of a time when the printed page was the only reliable means of conveying information. It's hard to imagine books ever going completely away but when faced with books I bought in the early 90s, like a Vogue encyclopaedia of sewing techniques, I saw how much technology has shifted the way I learn how to do new things. I haven't looked at any of those books in several years and not just because I have been too busy to take on new skills - it's so much easier to check YouTube. 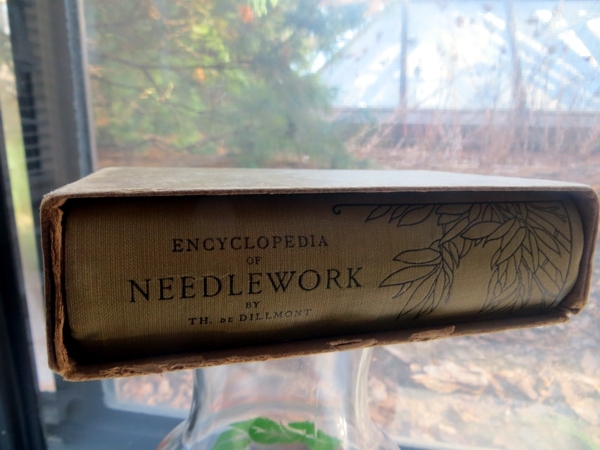 Going through the books and deciding whether or not to give them space in my new life, I was most enchanted by a late edition Encyclopedia of Needlework by T.E. de Dillmont. Maybe you know about this book but when I found out about it a few years ago I felt I had to have a copy, which was easily found in an online used bookstore because so many copies have been in print. I've never actually used it to learn how to do something. But as a window into the kinds of work that women did do, and in some cases still do, it is astonishing. So, so beautiful and intricate. Not just the work, but the drawings of the work. 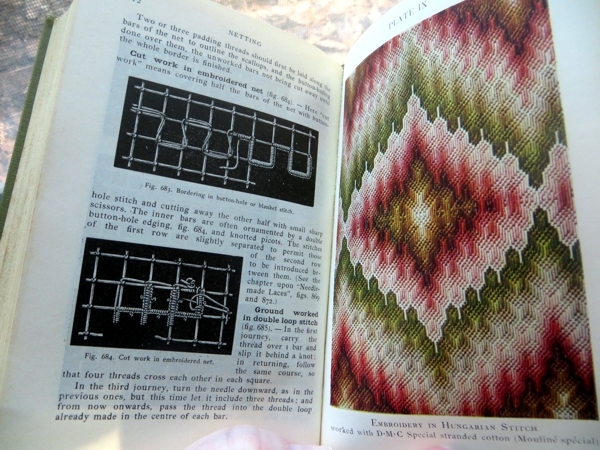 The women who bought early copies of this book would have learned needlework from a very young age and would refer to it to expand their skills or remind them of techniques rarely used. It's so different today, isn't it? We still indulge in needlework but for entertainment and relaxation, not necessity or to demonstrate affluence or taste. I don't know about you but in my experience it's much cheaper to buy than than to make our own knits and other textiles. Then, it was done to show love and skill and fill a need otherwise unmet. Now it's mostly about the love and skill. I love how compact this book is - so small it fits in the hand. Small enough to tuck into a trunk when you're starting a new life somewhere else. Full of every imaginable kind of needlework. It's the Swiss Army Knife of reference books! Of course I couldn't let it go. 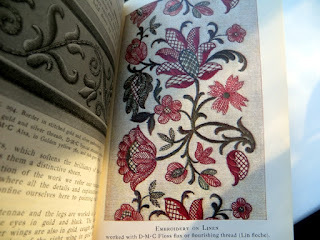 And if I ever have time to learn how to do truly fine handiwork, I have beautiful illustrations to go by. But I have to tell you - if you don't have a copy and you're wishing you did, THE WHOLE THING IS ONLINE! Yep. You can even get a Kindle edition if you want to download it and carry it around with you - after all, a smartphone is even smaller than this compact little book. Live it up, friends! And have a great day.